One Stitch Two Stitch | Daily jots of a bookworm's crafty revelry! Daily jots of a bookworm's crafty revelry! 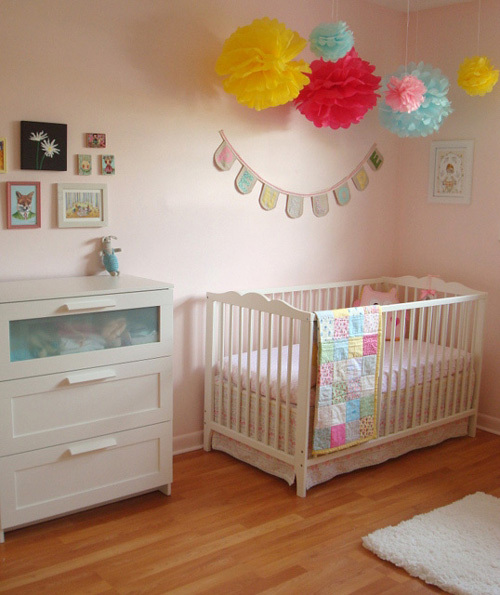 When I thought about setting up the nursery for my little one, I knew two things going in: 1) I was on a budget and 2) I wanted to make the room as personalized as possible. Ikea was, of course, my best option for nursery furniture while Pinterest was, of course, a wonderful source for handmade inspiration. I preferred to go with a medley of pastels -aquas, yellows, and pinks- rather than a specific theme. 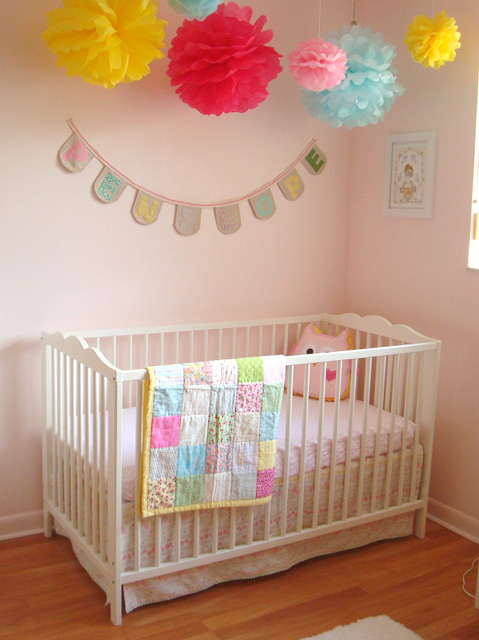 I decided to recycle the poms poms I made from my baby shower and hang them over the crib and changing table. This quilt I had sewn several years back with the hopes to have it ready for a little one. I had come close to giving it away a couple of times but just didn’t have the heart to part with it (glad I didn’t). I made the banner using muslin and calico fabrics and was a last minute project for my shower and later for the nursery. Although I loved this idea of a ruffled bedskirt, I really didn’t want to spend too much time on this sewing project, so I found a printed fabric and cut and sewed on rectangular sheets; I added a crochet edging to finish the bedskirt. I really love whimsical prints and had collected some over the years, but hadn’t found a place for them. Finally they have a home! 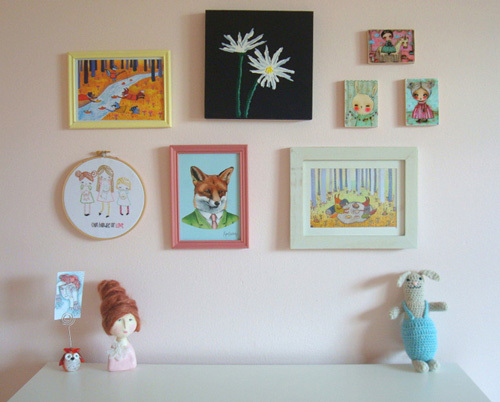 Woodland creature prints from papersparrow, daisy painting made by my bf, woodblock prints by danita art, embroidery made by me using Cathy Gaubert pattern, and Red Fox by berkley illustration. Without planning it, the birdhouses I painted seem to be a focal point for my newborn every time I change her, but it also might be that she just likes staring off to the right (she constantly does that) . 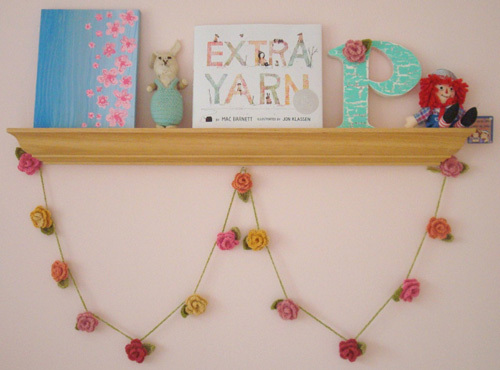 Love this little shelf, it showcases another painting made especially by my bf for our little girl, my bf’s beloved knitted bunny from his childhood, the decorative letter I made, and the garland I crocheted using the rosettes from my shower. One last thing, the picture book Extra Yarn is pretty amazing. I fell in love with the story and the illustrations are really adorable. During my summer vacation, I’ve been slowly working on some handmade decor for the baby’s room. I really wanted to make a decorative letter for her room and as always Pinterest is a great resource. I decided to give it a weathered look and used what I had in my stash. Here’s how I made mine: 1) I first painted a base coat of wicker white (2 coats) and then hand-stamped “Homemade with Love” with black ink over the dried base coat. 2) Once the stamping is completely dry, I brushed a heavy layer of crackle medium over the letter (let it dry ’til it has a tacky consistency). 3) I evenly painted one top coat* of Martha Stewart’s “Beach Glass” (love this color!). * Note: do not re-paint or try to go over certain areas, you’ll end up smudging the crackle medium and undoing the crackling effect. 4) For the border of the letter I inversed the colors – Beach Glass base coat, crackle layer, white top coat 5) To help prevent chipping and yellowing, I sealed the paint using Liquidex Satin Varnish (3 thin coats). 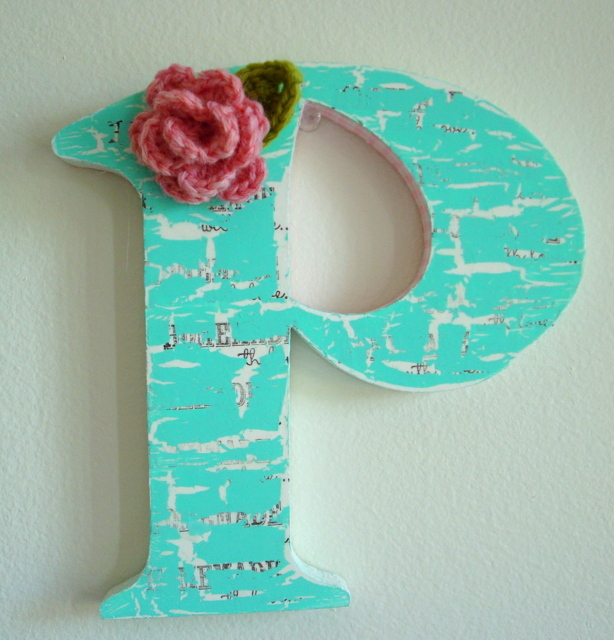 On the inside of the “P” I cut and glued a strip of pink gingham fabric as a contrasting accent to the seafoam color. 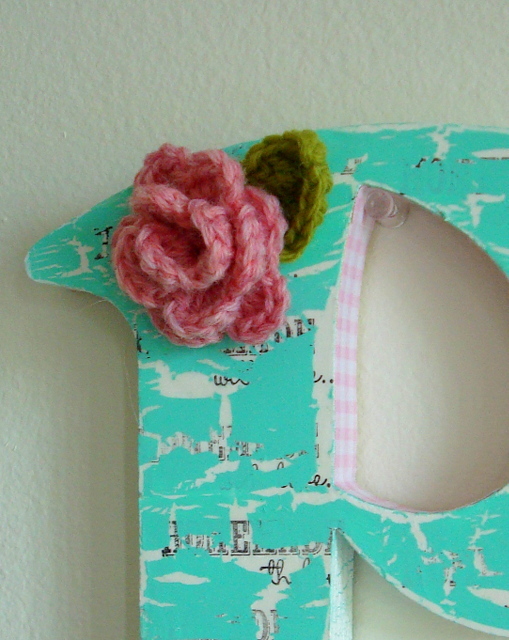 I also recycled a crochet rosette I had leftover from my baby shower (I had made them as brooches for my guests). I’m so happy with the result, the crackling effect came out great . . . 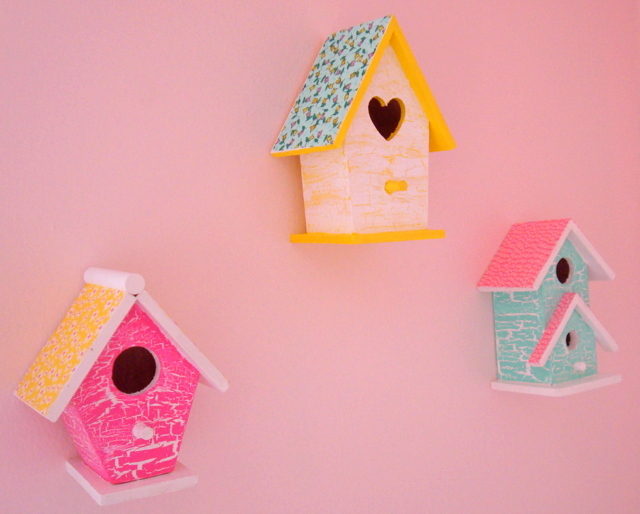 So great, I wanted to replicate the same weathered look on my birdhouses. I followed the same painting process and covered the roof tops with calico fabric. I highly recommend using Martha Stewart acrylics for this project (other brands did not work as well with the crackle medium). My color palette was Beach Glass, Raspberry Ice, and Chamomile. This will probably be one of the few pictures I’ll take of myself pregnant. I’d love to record my baby bump on a weekly basis but I’m not disciplined enough nor do I really have the time. But saving this picture is especially important because I just turned 41 and I want my daughter to have a keepsake of me at my happiest moment. 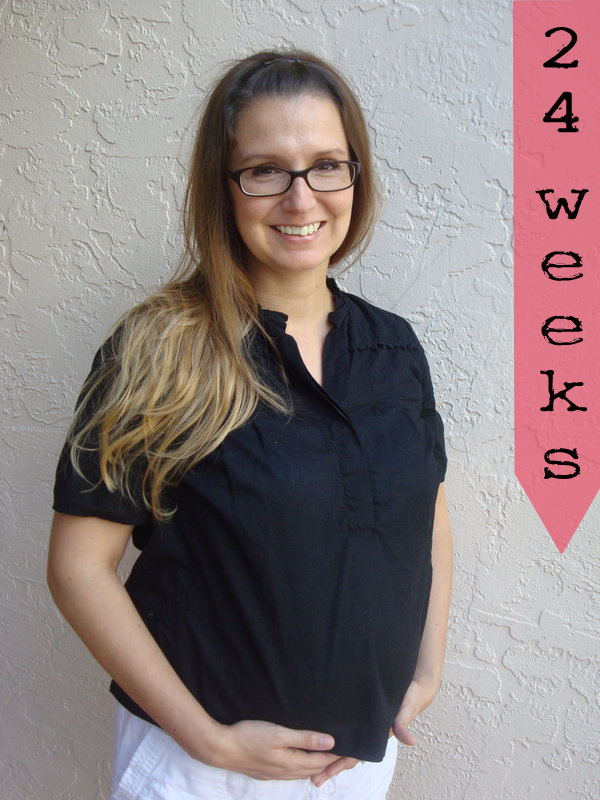 I spent 5 years trying to conceive and although I was able to get pregnant, sadly I couldn’t stay pregnant. It was a very emotionally draining journey and as difficult as the losses were, I felt that I just needed to keep on trying. And we did, one more time. For my sweet little baby, I hope that this simple picture is proof that we never gave up! Yes, it’s been awhile but there are valid reasons for my absence. Last year, my bf and I changed from renters to homeowners (yay!) and we found out we’re expecting (double yay!). A lot of responsibilities fell onto our laps in such a short amount of time that things have been quite overwhelming but we’re taking it day by day. Between work and fixing up our home (it’s been a slow process), I’m trying to fit in as many baby-related crafts as I can. 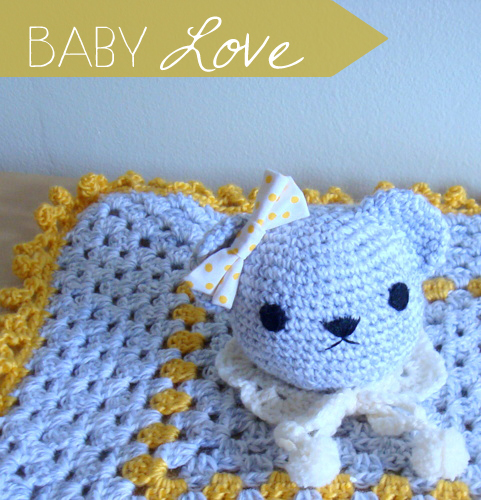 I’ve noticed that most of what I’m doing are crochet projects, and I think that I’ve gravitated to crochet because, for me, the whole process is so relaxing. 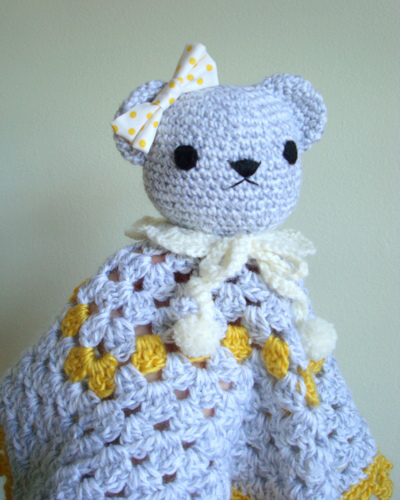 This little animal blanket was a design I came up with (amiguri crossed with granny square). Once I found out that I would be having a girl, I added the bow and lace collar which gives it a sweet touch. This short-sleeved cardigan I discovered on Pinterest. 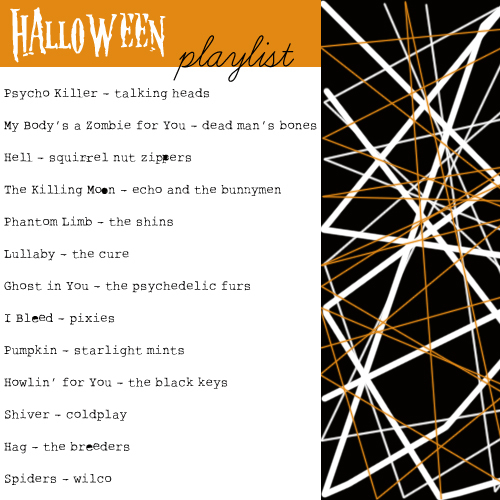 At first, I was a bit intimidated by the design but I was pleasantly surprised by how easy it was to make. 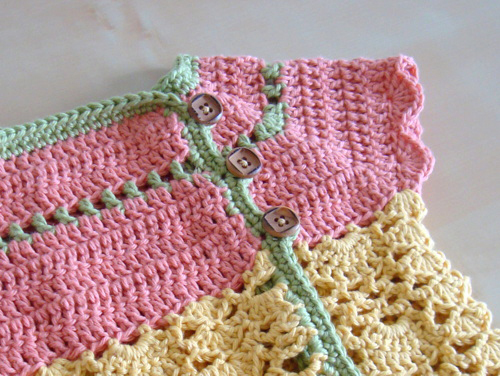 This free pattern is really easy to follow. 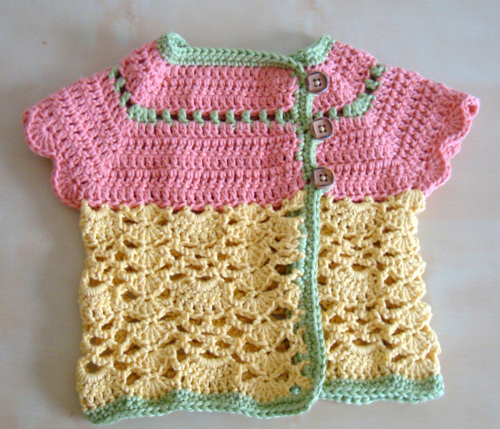 I used a linen/ cotton yarn blend in pistachio, butter, and coral colors. I love wooden buttons over plastic buttons. They look so pretty and rustic! 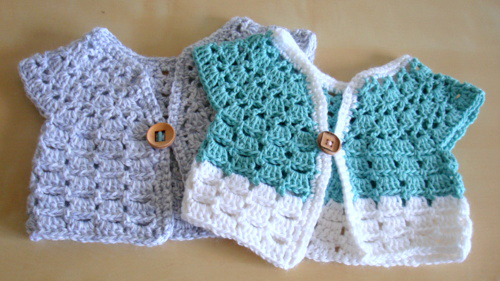 These cardigans came from another easy-to-follow pattern that I purchased from monpetitviolon. I did make some slight changes like making the cardis short-sleeved (long sleeves in South Florida really doesn’t work!) 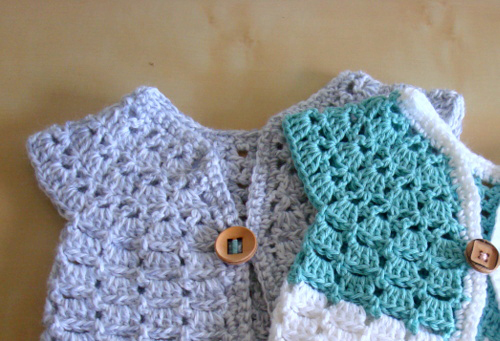 and adding one button closure, but other than that I followed the pattern to a tee. I know this board is a bit belated, but there’s always next year! This board was inspired from a reading lesson I taught last week. My 2nd and 3rd graders read the poem “Theme in Yellow” by Carl Sandburg. The children learned about different points of view and how the perspective of a story can change based on who’s speaking. 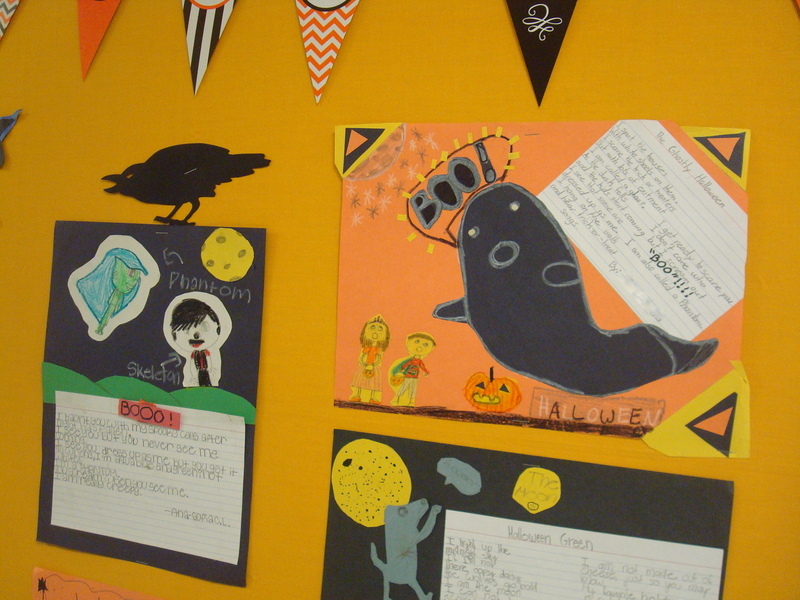 Once the children had a strong grasp of the skill, we brainstormed different objects connected to Halloween. 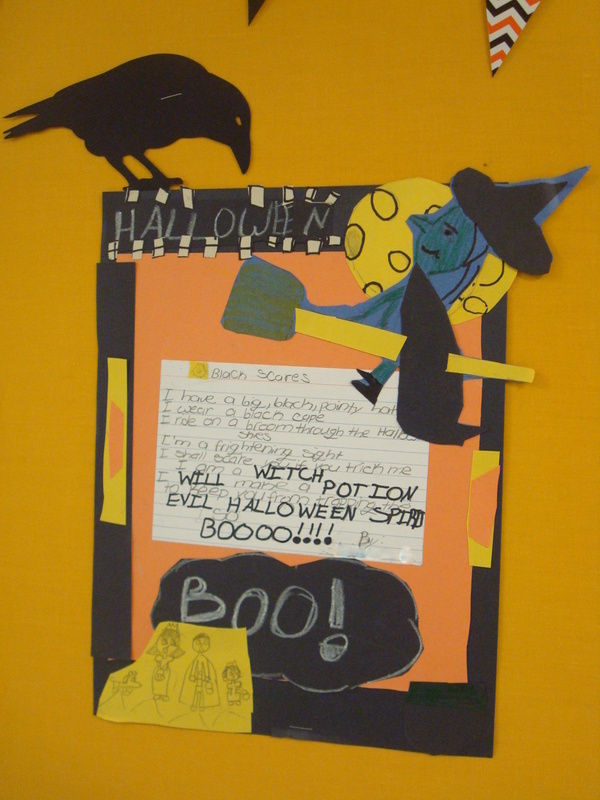 The children were then required to write from that object’s perspective about Halloween. The children really loved this lesson. There were funny witches, friendly ghosts, a lonely haunted house, and even a gloomy trick-or-treat bag. Both their poems and artwork were amazing! 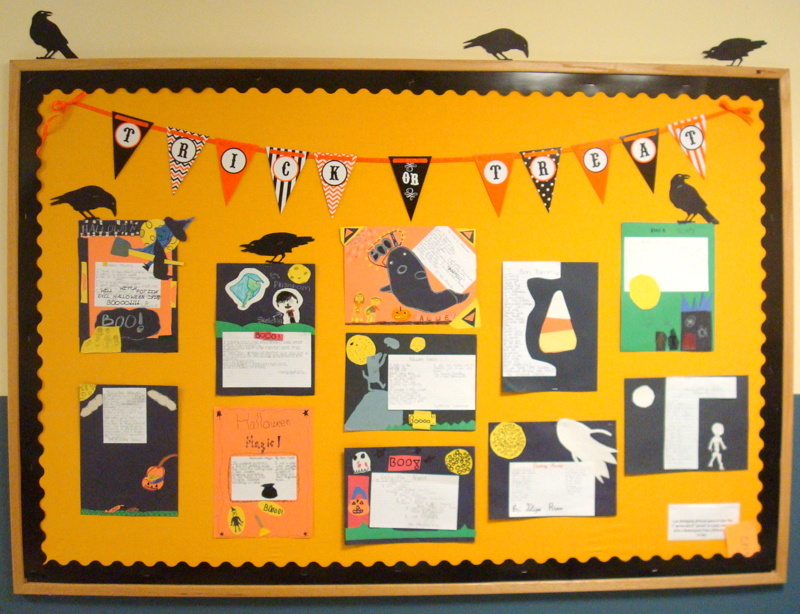 As for the bulletin board, most of my materials I already had: 2 yards of egg yolk fabric, wavy black border, a Halloween banner ($1 at Joanns) and silhouette ravens (dollar store find). I think the best bulletin boards are the ones that you don’t plan out too much, and this one came together quickly in an afternoon; you got to love it! I had fun this Halloween and had the chance to get dressed up twice. My first costume was for a pumpkin carving party this past weekend. 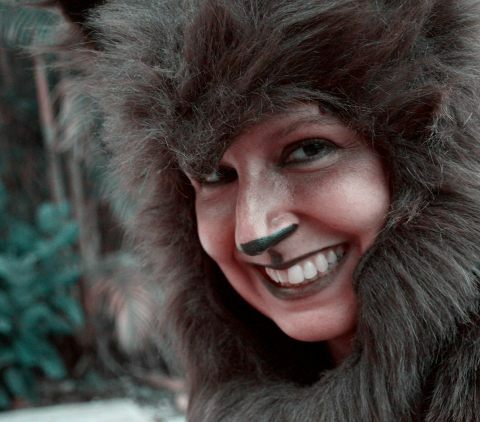 I decided to reprise a wolf costume I’d worn a couple years back; it’s made up of a headpiece and fur paws. This time around I made more of an effort with the make-up. I used lots of golds, bronzes and brown eyeshadows. For the contours on the nose and cheeks, I used a dark, matte brown. 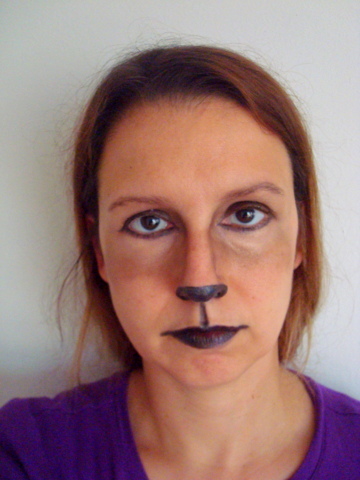 I added black eyeliner crayon around the the eyes, nose, lips. Once I put the headpiece on, it looked really cute. Then for the school, I thought it would be fun to creep the kids out a bit . . . 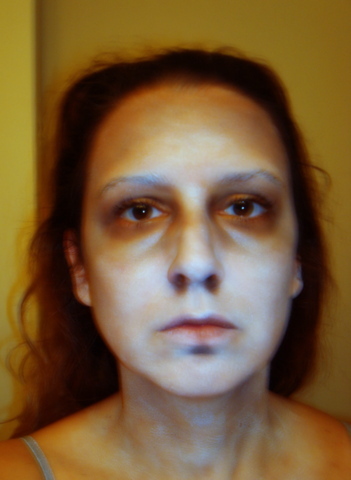 This creepy make-up tutorial helped me a lot. I used mainly a dark plum eyeshadow, a dark matte gray for contouring, and deep copper to outline my eyes. 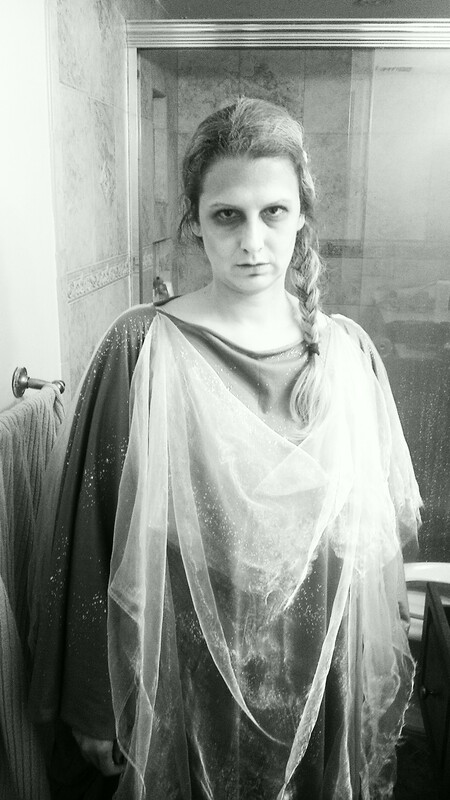 I made my ghost costume two days before Halloween. At first I thought I wouldn’t be able to pull it off. Thankfully the jersey fabric I got was really easy to work with and I was happy with the results! Hope everyone had a great Halloween! 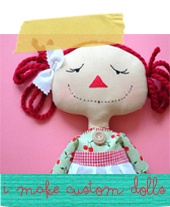 Interested in a custom-made rag doll? Visit here for ideas or click here to place a custom order!